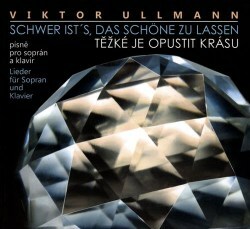 Viktor Ullmann’s corpus of songs occupied him for much of his sadly truncated life but one of the frustrations is that so many of his early works have been lost. His 1923 Seven Songs cycle is no longer extant and we have to wait for the Albert Steffen songs, his Op.17 of 1937 to find the first complete, surviving cycle. His propensity for extended tonality is evident in this mature example of his work though it’s a cycle that admits freshness and variety and there are even elements of impressionism in the piano writing in the last of the six songs. By contrast the Ricarda Huch cycle of 1939 is more frankly lyrical especially the second of the five, though the central one, the Storm Song – whilst very brief – offers a contrasting scena. It’s not always easy to date Ullmann’s works – had he survived the war doubtless he would have been in a position to rationalise the published, self-published and manuscript works, so reconstructing chronology is somewhat speculative, not least when erroneous opus numbers exist. The Spiritual Songs, Op.20 received a private hearing in 1940, since no real public opportunities were available for Ullmann in occupied Prague. There are six songs, of which two are also heard here in alternative settings of the original poems. These are the two poems of the American Percy MacKaye – First Meeting and Christmas Morning in Dornach. This is a particularly consonant set, with few of the abrupt contrastive devices of the earlier works. They are songs of great delicacy and refinement, their allusive qualities expressed in nocturnes of slow measured tread. Given the abrasions of Ullmann’s life and the depressions to which he was prone it’s not surprising that we encounter songs of listless melancholy such as Schwer ist’s but it’s equally valuable to encounter his range of poetic interests. He set three of Elizabeth Barrett-Browning’s Sonnets from the Portuguese in the translations of Rilke and here there is plenty of chromaticism, loose harmony and flaring-up of feeling, not least in the central sonnet. Even more noteworthy was his exploration of the sonnets of Louïse Labé, which are more expressive and intimate. Indeed there are elements of vampish whimsy in some of the piano accompaniments. It’s sad to realise that only one of the Songs of French Children has survived, and that one of the three Chinese Songs is missing – especially as the intervallic leaps and dissonance of this little cycle are very effective. The Hölderlin-Lieder are only three in number but effective. One of his last series of songs was the Three Jewish Songs (Brezulinka), Op.53 which included one of his longest single songs, Berjoskele. He gets near to folksy-Judaic in the last of them though it still remains somewhat stylised and formal. Ullmann isn’t one to become unfettered in his song settings, even in extremis. One of the frustrations of the handsome-looking book in which the two discs are housed (138 pages but CD-sized except in girth) is an oversight: no track numbers are included next to the individual songs. I struggled quite a bit, and the repeated (English) settings of the Spiritual Songs may well trick the unwary into thinking this cycle is actually eight songs in length. There are good notes, in Czech, German and English and songs and translations in all three languages – with the exception of Hölderlin’s Der Frühling, which has gone AWOL. Soprano Irena Troupová used to be quite well-known for her immersion in Early Music but she’s since expanded to take in Czech music of the inter-war years and is well versed in the milieu. She captures Ullmann’s Schoenberg-Zemlinsky side very well, though some of his more unforgiving registral leaps find her tone – inevitably perhaps – somewhat pinched. Jan Dušek is her well-attuned colleague, who has few opportunities to indulge in postludes but sticks to the singer like glue. Glitches quietly noted, this is a compact and valuable addition to Ullmann’s representation on disc.